Step-up and become a model in this new exciting campaign! “About Face” was a campaign in partnership with photographer KEO LIN (Click HERE for more information about Keo) challenging racism, sameness, body image and much more. Its design was to commence with men as a focus, in a series of events cumlinating in a photographic exhibition and a number of public forums along the way. Funding was not forthcoming to enable events as planned however Keo Lin further developed this important work independently. “Venues Reporting Violence” was a successful initiative developed by the Anti Violence Project to train venue staff (security, bar staff and management) to individually and collectively support patrons who approach them with reports of violence. 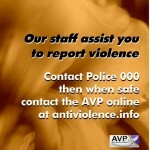 It encouraged a culture of reporting of violence to Police on 000 and, when the person is safe, via the AVP’s online reporting service. This initiative rolled out in four Stonnington licensed premises and shortly afterwards in two Moreland GLBT venues. It was a direct response to violence occurring which was under-reported, often never to be reported. Victoria Police GLLOs were partners and this pilot was presented at the Stonnington Liquor Accord where municipal partnership was achieved. Discussions also took place with the Moreland City Council for a similar relationship in that municipality. Planned campaign extension beyond the pilot did not occur due to the absence of public funding. Stop Homophobia Today! was the International Day Against Homophobia Campaign (IDAHO) in Victoria in 2010 headed by the Anti Violence Project and partnered by Victoria Police, the ALSO Foundation, the Victoria Gay & Lesbian Rights Lobby, the Victorian Equal Opportunity & Human Rights Commission, Gay & Lesbian Health Victoria and other key organisations. The 2010 initiative acted as a catalyst to bring Victoria’s community to the table each year to acknowledge IDAHO and encourage events across the state. IDAHO activities, with more visible inclusion and acknowledgement of the Transgender community are sometimes known as IDAHOT. Speak Up! was a series of anti-homophobic harassment posters encouraging gay, lesbian, bisexual and transgender people to report acts of harassment or violence to Victoria Police. The first posters and other campaign materials were launched at the Melbourne Town Hall on 30th January 2008 during the Asia Pacific OUT Games Human Rights conference and the campaign is designed to raise awareness of the importance of reporting homophobic violence and increase the overall safety and well being of gay, lesbian and transgender people. Research carried out in the United Kingdom suggests that only 10 per cent of homophobic violence is reported to police. Alarmingly, a similar trend has emerged in Victoria as documented by the Gay and Lesbian Health Victoria’s “Coming Forward” report. Our message to you is that when victims speak up, perpetrators can be stopped from doing the same thing to someone else. Partnering the AVP in Speak Up! were the ALSO Foundation, the Victorian AIDS Council/Gay Men’s Health Centre and Victoria Police with the assistance of the City of Melbourne, Minus 18 and the Victoria Gay & Lesbian Rights Lobby. 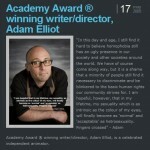 The website was hosted by the now defunct ALSO Foundation so is no longer publicaly accessible. “Gay Bashing is Gutless” was a campaign devised by the VicAVP to target masculinity, perpetrators and the intimate social networks surrounding perpetrators of violence including their male “mates” and female friends and sexual partners. 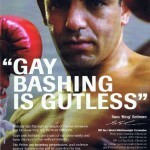 The campaign image of an award winning boxer was designed to appeal to the heterosexual men who fit the profile of perpetrators of violence against the GLBT community, especially when they expressed their prejudice among their social peer groups. 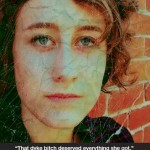 Evaluation of the campaign, subsequent requests for materials and the distribution of these, has revealed a successful connection with the woman partners of heterosexual men committing violent acts against people they see as “weak” or “diminished power” than them – “If my boyfriend or husband can bash gays when he’s drunk then he’s likely to bash me too” is a defining comment from one women. The VicAVP self-funds re-prints of the “Boxer” poster without government funding. To request copies, please email us. The AVP’s partners in the “Gay Bashing is Gutless” campaign were the Lance Reichstein Foundation, VicHealth, Victoria Police, Crime Prevention Victoria and the City of Melbourne.